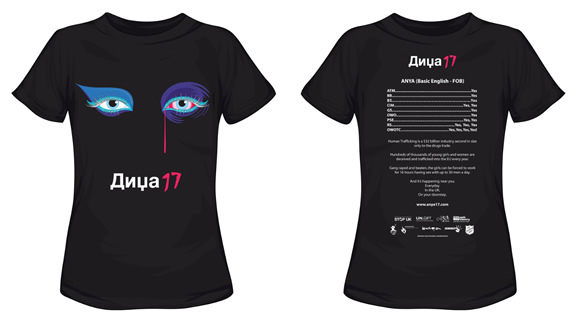 It’s premiere week at Anya17 and while the cast and musicians have the final few rehearsals you could be in with a chance to win one of the fantastic Anya17 T-Shirts designed by Stu Jones. Competition closes Saturday 10th March 2012. Read Stu Jones’ original post revealing the truth behind the T-Shirt design. Winners will have the choice between a T-Shirt with the full back design or with the front logo only. We will also be running a Twitter only competition which we will announce details of later this week! In my last blog post I promised I’d shed some light on the story behind the mysterious code on the rear of the Anya17 t-shirts. So for any of you who have been waiting with bated breath, here we go. When we first met Ben he had a pretty good idea of what he needed to do from a marketing point of view to get people excited about Anya 17. Getting a buzz going about the opera was absolutely essential. It was natural that, during our initial conversations about the logo, talk turned to include the other visual aspects of the project: the website, Facebook, Twitter, print work and other general merchandise, including t-shirts. We all thought t-shirts were a fantastic way of getting the branding out there and seen by as many people as possible. It made perfect sense to have the (at that point undesigned) logo as the most prominent element on the front of the shirt. Then there was the small matter of the back of the t-shirts. We all felt that the rear of the shirt gave us a great opportunity to share more information about the project aims and to spread awareness of the trafficking issue. Therefore, as well as the logos of any sponsors, a bit of information on the rear about the cause was a must, but we also wanted something a bit different that would really serve as a conversation starter. During our first phone call Ben had already talked about the kinds of services girls in Anya17’s situation were being forced to offer by the traffickers. The way these services were advertised to potential customers (so-called ‘Johns’) was very particular and listed as a “menu”. This menu of services varied from girl to girl and was written using a code of acronyms. The code had apparently originated as a way for ‘Johns’ to elude the police on internet prostitution websites. Ben explained the code was very well known to the ‘Johns’ and each individual acronym was usually listed together with an indication of price, again written in code. We all thought that this menu would make very interesting print for the rear of the t-shirts. The idea was to use it as a device to inspire questions and conversation but I especially liked the way the format seemed to echo that of rock band tour t-shirts. However, instead of listing the venues of the performances, ours would listing the different types of ‘performances’ themselves. With that decided, all that was left was to design the actual t-shirts. As you will have seen if you have looked at the t-shirts on the Spreadshirt website there is rather a lot of stuff crammed onto the back. As we were including the rather provocative code we thought it was important to also give facts to put it in context and to bring home the shocking reality of the issue. We really liked the idea of indicating the sexual nature of the obscure code through a climax style use of the word yes after each ‘service’ and contrasting this with some text explaining the cold reality. Not only would it be a conversation starter for anyone not in the know, it would also act as a kind of slap around the face for anyone who did know the code, and would hopefully inspire some empathy. The rear of the t-shirt is then finished off with the ever growing assortment of supporter logos, thanks to all Ben’s hard work in getting everyone involved. So finally, for those of you who are itching to know, the meaning of each of the acronyms in the code are listed here. Please be warned, however, that they are obviously of a sexual nature so if you’re a bit faint-hearted or easily offended please stop reading right here. 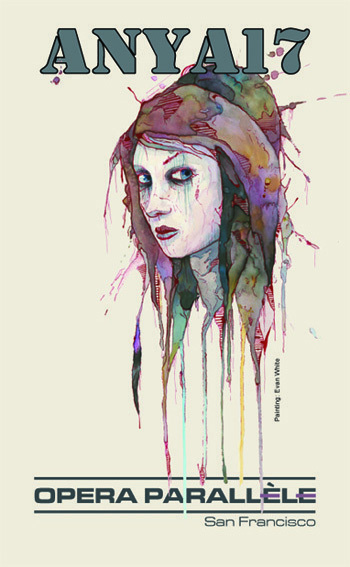 Hi Everyone, I’m Stu and I’m responsible for creating the artwork for the Anya17 project. Following on from the recent t-shirt launch I was going to start by telling the story behind the artwork, and follow it with an explanation of the more cryptic parts of the text on the reverse of the t-shirt. However, before I do that I’d like to give a bit of background on my involvement in the project and the development of the visual side of things so far. From the first time I spoke to Ben on the phone it was immediately apparent that he had a real passion for both the subject and the project. He talked at great length not only about the project but about the whole thing – the girls, the traffickers, the statistics and the horrendous reality of the situation for all those tricked into that life. All this was punctuated by some truly disturbing stories he had come across over the course of his research. By the end of the call I knew that I had to be involved. It was a combination of his passion, the great cause and his genuine trust and openness meaning I could really go to town with the artwork. I suppose its about time I introduced myself properly! I’m Anna, the Web Designer who will be creating the website to promote the amazing project that is Anya17. I am very proud to be working with my Partner Illustrator Stu Jones who created the stunningly beautiful yet provocative and disturbing logo! Ben Kaye first rang me back in July about creating a logo, saying he had been recommended to me by someone I had never heard of and he then googled me by general location. To this day I am not sure whether it was me he was even supposed to call or if he got the wrong company, but either way I’m pretty sure it was fate! I hope that he certainly came to the right person as I have specifically been looking to get involved with more ethical and charity related web design projects, after all it must be every designers dream to do work for ‘good causes’ for the greater good of others.